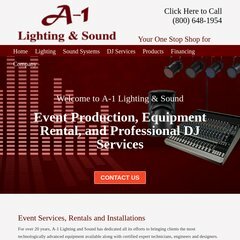 Topics: Lighting Systems, Follow Spot Lights, Fog Machines, Specialty Lighting, and Av Lamps. It is hosted by Colo4dallas Lp (Texas, Dallas,) using Microsoft-IIS/6 web server. It is written for ASP.NET language. It has 4 nameservers, including ns2.lunahost.net, ns3.lunahost.net, and ns1.lunahost.net. PING www. (206.123.126.33) 56(84) bytes of data.